As I've said before, there will be a demo cast reading/recording of the pilot script, The Town of Miracles, courtesy of my good friend/co-worker, theatre veteran Keith Matthews. 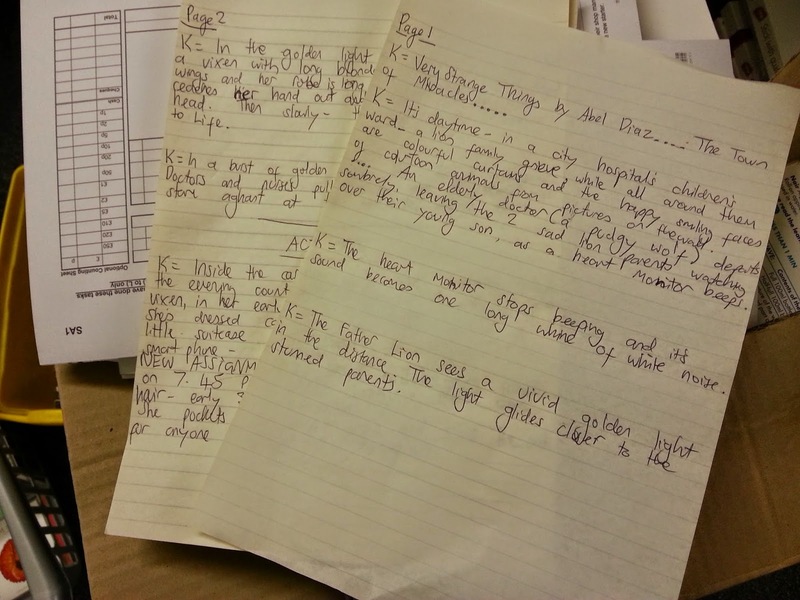 Right now, with the main cast assembled (more on that in the future, so stay tuned...), Keith is working on a more theatre-friendly version of the script to work better for the readthrough, as well as for the audio recording. This is mainly in rewriting the action lines of the teleplay to be shorter, and serve more to just establish a scene for the actors to then work off of, and not be as actively running or potentially intrusive as in the actual TV version of it. Below is a photo of what's been drummed up thus far (bearing in mind how busy the store is right now because, well, 'tis xmas). The reading is, as I've stated before, due to take place sometime after the holiday period (circa New Year or early January) to enable both time for rehearsals, so there will be more updates on this in the coming weeks as the drafts progress and the rehearsals begin. So, have fingers crossed for the very, very best!